I play with stocks using an Updown account. Its part learning tool, part practice arena and mostly just a game. This is my annual summary of my results in Updown for the year 2010. 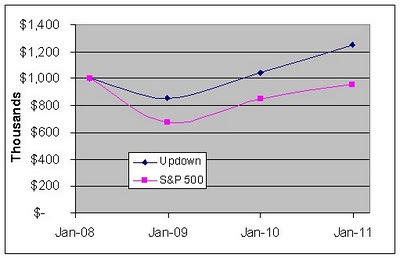 As I discussed in my recent December summary for Updown, in 2010 my Updown portfolio was up about 20%. The S&P 500 was up about 13% for the year. In 2010 I beat the index by about 7%. The previous year in 2009 the S&P beat my UPDown results. 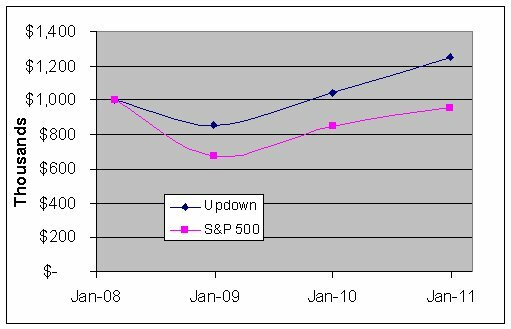 I was up 22% in update and the S&P was up 26% in 2009. So the S&P 500 beat me by 4% for the year of 2009. In the two year combined period covering 2009 and 2010 I'm up about 4% more than the S&P 500. 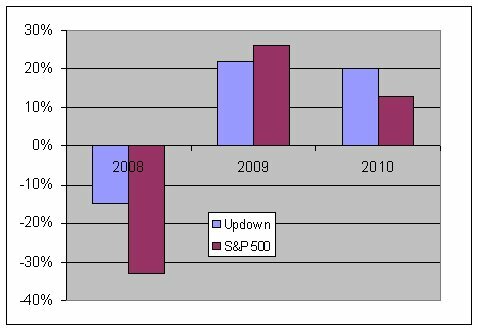 I started Updown in March 2008 and since then I'm up 24.9% while the S&P 500 is still down -4.3%. Here is the yearly performances shown graphically. 2008 year is just the 9 months at the end of 2008 post March. For the last two years I'm doing OK but not great. I am ahead of the S&P overall but they beat me one year and I beat them one year. I'm only ahead by a few % points over the past two years. Given the work and risk involved I don't think its worth it to beat an index by 4% over two years when the market is up over 40% in that time. But I did a lot better than the index in 2008 and my overall returns are much better off because of it. I'd certainly rather have $1.2M than $950k so in that respect I'm clearly beating the index. Dividends contributed about $39,582 to the portfolio for the year. That is about a 3.7% yield on my portfolio for the year as a whole. Remember that this is not real money so it shouldn't be thought of as equivalent to a real portfolio. There are many reasons that my results in Updown differ from what I'd expect to see in real life. Updown is pretend money and I treat it that way. I am not very careful with my investments in Updown. Since theres no real risk with the money I don't worry or take too much care to make the right investments. This is not to say I don't try to make money with Updown. I do try to make money for nothing more than the fun of having a higher 'high score' in the game. But if I'm going to gamble with pretend money my risk tolerance and attention to detail when performing analysis is not the same as if I were investing real money. This factor may both hold me back and improve my results. On one hand since its a game I might make purchases on a whim that aren't that thought out and then not worry about them too much. You might expect that to lead to poorer results than if I was more careful, diligent and serious in my investments like I would be if I had invested real money. On the other hand since its a game I'm not too worried about taking higher risks and generally if you take higher risks and bet right then your returns will be higher. So if I'm less risk tolerant and make some good choices then I could make a lot more money in Updown based on being more aggressive with the investments there. I use Updown to try out strategies. This is part of the reason I'm using Updown in the first place. Updown is a game and a tool for me. As a tool I use it to try out an investment strategy and see how it might work. Some of these strategies are flops. Lots of unused cash. My Updown portfolio right now has over $500k in cash and only around $700k in investments. That is a lot of cash that is sitting idle and not making a return. If I had closer to 100% of my Updown assets invested in equities then I might have achieved a return closer to 30-40% rather than the 20% rate for the year.